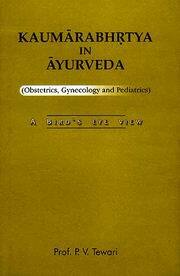 The book in Ayurveda is an effort to epitomize subject related to neonatology and pediatrics scattered in Vedas, upanisada, smrties, grhyasutras clasics written from earliest to pre-independence period. Entire subject is presented under specific chapters/heading accepted/practiced today and relevant references have been added at the end of chapters. It is hoped that the book would be of immense help to inquisitive historians, research workers, teachers and students in getting specific references without wasting time and energy in going through entire texts. P.V. Tewari was a coordinator faculty of Ayurvedic and is well known for her significant contribution in the field of literature clinical and experimental research work. She has produced large no. of Ph. D Published research paper in national and international Journals; written, edited and translated, contributed chapters and written forewords in no. of book; delivered keynote lectures, extension lectures, and has completed projects sponsored by W.H.O. governmental and non-governmental agencies. She has been associated with highest academic and administrative bodies of Ayurveda and is recipient of national and international awards.